Dave Powell is a native son of Montana. In a world of change and transition, few can say they have roots in one geography that go back four generations. Dave’s pedigree in art is just about as deep. He is the son of artists Ace Powell and Nancy McLaughlin Powell. That heritage leads back to the likes of Charlie Russell and Joe De Yong, both famous for their abilities to “tell the story” through their art. His father, Ace Powell, was a prolific Western artist whose first childhood paint-box set was a gift from Charlie and Nancy Russell. Dave became a serious student of art in his mid-teens, and has been a professional artist most of his adult life. Over the years he has worked with Bob Scriver, Ned Jacob, Robert Lougheed and Tom Lovell. Dave will be the first to give thanks and credit to CAA founder Joe Beeler for his longstanding friendship and guidance over many years. Because of his vast knowledge of the dress and habits of western Indians, pioneers and cowboys, Dave is often called upon to provide costumes and props, and to give technical advice about authenticity for films and television. 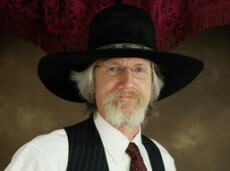 Productions he has worked on include Good Old Boys, Silverado, Lonesome Dove and Seabiscuit. His interest in historic reenactments and rides have taken him all across the West, and these travels have afforded Dave the opportunity for inspiration. While his film work utilizes his experience and observation, his sculptures, paintings and illustrations are born of his imagination.